It was twenty years ago today, under the wide-spreading boughs of a tree in the front yard of a house on Long Island, that Kat and I exchanged our wedding vows before a small crowd of friends and family. Immediately after, we all moved to the tent in the back yard to celebrate. The twentieth anniversary is, traditionally, the china anniversary. Kat’s immediate reaction upon hearing this was that it makes total sense, since by 20 years you’ve probably broken most of your wedding china and need replacements. For us, though, the resonance is a little different, since our honeymoon was a trip to China. And therein hangs an origin story. At some point in the late 1997, Kat and I were at a Meyer family gathering, probably Thanksgiving, at my paternal grandparents’ house in Cincinnati. As was my wont, I was perusing the stacks of National Geographics they had always lying around. Not like in a dentist’s office; no, these were always up to date. But there were always many of them, interleaved with many similarly contemporary Readers’ Digests. I picked up one with a cover shot and title about China’s Three Gorges , and started leafing through it, eventually reaching the cover story. It chronicled the incredible landscapes of the Three Gorges of the Yangtze River, soaring cliff faces and ancient villages. I was immediately captivated by the story and especially the photography. 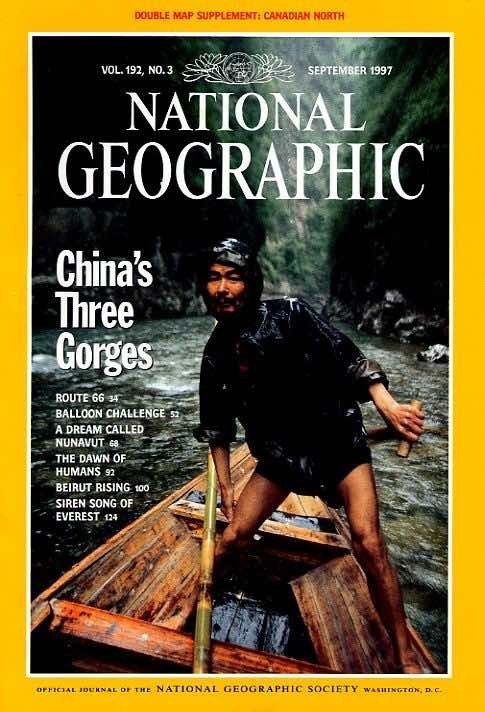 I decided that I wanted to see the Gorges before they were submerged by the Three Gorges Dam Project, which is the sort of snap decision I almost never make. Usually I take time to analyze an idea and game out scenarios before reaching a conclusion, but not this time. I was immediately certain. I was certain enough to say it out loud to other people, like Kat and my parents and, who knows, probably a bunch of my extended family. Now, fast forward a bit. At the end of that same year, Kat and I were with my parents for Christmas. We went out to dinner at Mom’s favorite spot for her birthday (also Boxing Day) and my parents said they had presents for me and my sister. We each got an envelope. Both of them contained checks for several thousand dollars, windfall of an inheritance distribution that Mom had insisted be passed on to us. In mine, with the check, were a number of brochures for tours of China. I was speechless. Kat asked what it was a couple of times, a little bewildered by the look on my face. And here I must take a side trip. Kat and I had been on a trip to California a few weeks prior, just the two of us. We spent a couple of nights at Ragged Point, a spot I’d stumbled over on a previous solo trip, back in the days when the rooms intentionally had no TVs or phones. The restaurant was booked by a large group, so we ate dinner alone on the open patio under a heat umbrella, looking at the stars and enjoying the fantastic food; the chef at the time was a genius. Music played softly through hidden speakers, and although we were literally sitting outside it felt as quiet and private as any candlelit back room. “The Christmas Song”, generally better known as “Chestnuts Roasting on an Open Fire”, started playing. Kat, smiling, asked me if I would like to dance. So we stood and danced close together, slowly shuffling around the open space the way untrained dancers do, just us and the song and the stars. Kat swears I drew breath and opened my mouth to ask her to marry me. Maybe she’s right. But I didn’t, then. Nor the next day. Nor on Christmas Day. Which caused Kat to start thinking that maybe it wasn’t going to happen at all. She was feeling disappointed and hurt by this, as you can probably imagine, but keeping it to herself because she wasn’t sure yet if she was right or wrong. So: back to Mom’s birthday dinner in Mansfield, Ohio, and me sitting stunned by the check and the China brochures and this unexpected, unprecedented windfall. “Eric, what is it?” Kat asked again, with some concern starting to color her words. “We’re going to China!” I finally blurted out. “No, you’re going to China,” she replied a little tartly. “No, we’re going to China,” I repeated. Because in that moment, right there, I knew that this trip I wanted to take, the things I wanted to see so badly before they were gone—I couldn’t imagine doing and seeing all that without Kat. That’s when I knew, beyond any shadow of a doubt, that I wanted to marry her. I didn’t propose that night either, because I had to explain this all to her in halting, still-new words and help her (and me!) understand what had happened. She got it, as I think I knew she would. We went shopping for rings just after the New Year. I formally proposed to her, shivering on an ice-crusted deck by the Chagrin Falls, on her birthday in March. 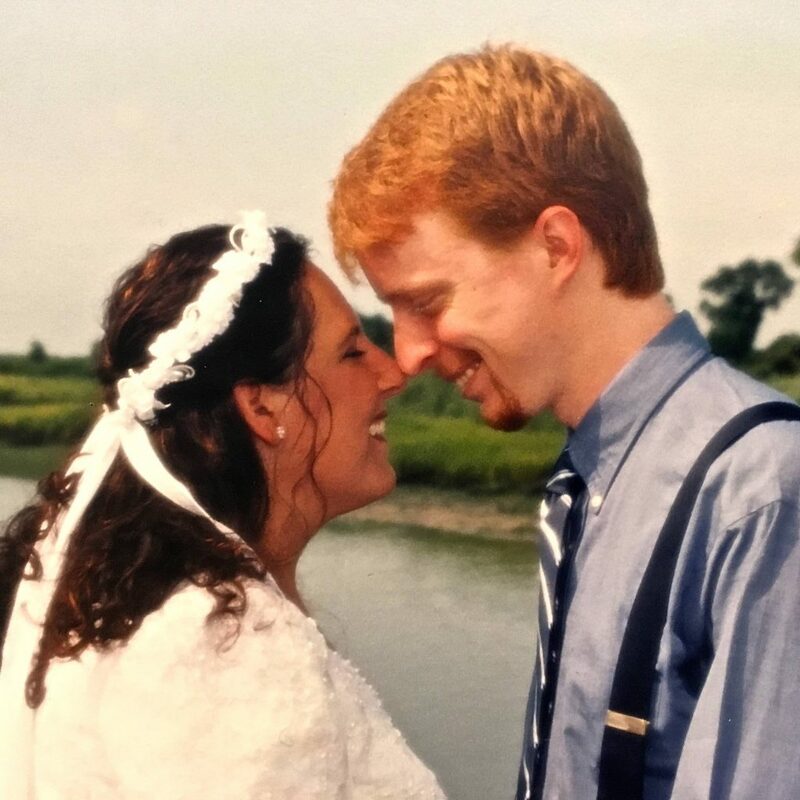 And on July 19th, 1998, we stood underneath the spreading boughs of the tree in the front yard of her childhood home, and exchanged our wedding vows. A short time later, in a backyard tent in the heat of a mid-July afternoon on Long Island, we stood on the compact dance floor and danced to “The Christmas Song”, baffling half the attendees and bemusing the other half. The next very day, we flew to China, and saw so much together over the next seventeen days: the Three Gorges, yes, but much more. Suzhou, Dazu, and Guilin stand out in particular for being a little more remote and not so overrun by tourists, the kinds of spots we always find inherently more interesting than large cities and glitzed-up, polished destinations. We still want to go back to Guilin some day. In the two decades since we vowed to love and honor and respect and amuse each other, we’ve had many adventures together. Some were incredible, some were stressful, and some I would have spared us both. Picking out a card was difficult, with so many of them written as if 20 years together could never be anything but an unbroken stretch of bliss and good fortune. We’ve been through too much to respond well to such bromides; we’ve had fortune great and terrible, difficulty and ease, endless joy and boundless grief. Every one of those days and weeks and months and years, we’ve supported and shared with each other. Kat’s been so strong, and so selfless, and I’ve tried to be the same for her. Neither of us did so perfectly, but we always tried—and we always understood when the other had to nurse a weakness, or look inward for a while. We have always been honest with each other, and accepted each other. 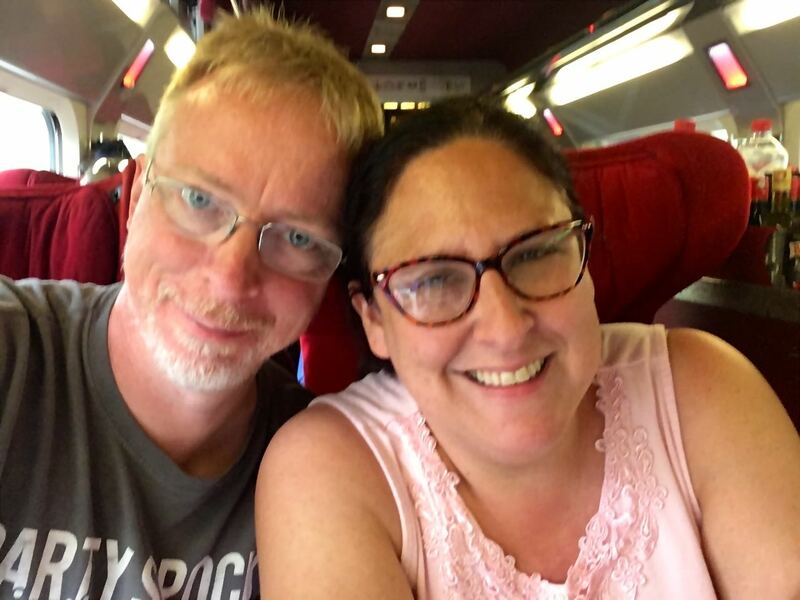 That, more than anything, is what’s allowed us to travel together these two decades and still love each other. I couldn’t have asked for a better partner in life and death than Kat, and I hope she’s even half as proud of and grateful for me as I am for her. Happy China Anniversary, my love. What is the CSS ‘ch’ Unit? Well… yes and no. Specifically, yes if you’re using fixed-width fonts. Otherwise, mostly no. So however wide the “0” character is in a given typeface, that’s the measure of one ch. In monospace (fixed-width) fonts, where all characters are the same width, 1ch equals one character. In proportional (variable-width) fonts, any given character could be wider or narrower than the “0” character. To illustrate this, here are a few example elements which are set to be exactly 20ch wide, and also contain exactly 20 characters. It’s probably no surprise that in Courier, all the elements are the exact same width as their text contents. In Helvetica, by contrast, this is mostly not the case except for numbers, which appear to be fixed-width. In Georgia, by contrast, none of the text contents fit the boxes, not even the numbers. What I’ve found through random experimentation is that in proportional typefaces, 1ch is usually wider than the average character width, usually by around 20-30%. But there are at least a few typefaces where the zero symbol is skinny with respect to the other letterforms; in such a case, 1ch is narrower than the average character width. Trajan Pro is one example I found where the zero was a bit narrower than the average, but I’m sure there are others. Conversely, I’m sure there are typefaces with Big Fat Zeroes, in which case the difference between ch and the average character width could be around 50%. So in general, if you want an 80-character column width and you’re going to use ch to size it, aim for about 60ch, unless you’re specifically working with a typeface that has a skinny zero. And if you’re working with multiple typefaces, say one for headlines and another for body copy, be careful about setting ch measures and thinking they’ll be equivalent between the two fonts. The odds are very, very high they won’t be. It would be interesting to see the Working Group take up the idea of average character width as a unit of measure—say, 1acw or possibly just 1cw—which actually uses all the letterforms in a typeface to calculate an average value. That would get a lot closer to “make your columns 60 characters wide!” in a lot more cases than ch does now. In another timeline, an early alarm woke Kat and me this morning so we could sneak into Rebecca’s room with her siblings and wish her a happy birthday at the moment she turned ten, 7:24am, June 7th, 2018. Ruth, who still dreams of Rebecca, happy dreams that make her waking sad. I have dreams like that too, when I remember them. I don’t often remember my dreams. But sometimes, I get to spend a little time with her, free of sorrow, on a nighttime walk or at an amusement park my subconscious constructed out of all the parks we ever took her to. Kat and Carolyn and Joshua and I went to the grave marker this morning, because Kat works all afternoon into the evening and Joshua has an all-day LEGO and chess camp and Carolyn has friends to see before summer vacation gets crazy. Because life moves on even when a part of you can’t understand why the sky doesn’t collapse and the world doesn’t crack open and time doesn’t shatter into a million sharded memories. Classes get taken, grades get graduated, camps get attended, trips get planned, work has to be done. Each day follows on the one before, pulling you further and further away from the last moments your life was normal. We stood or sat or huddled around the flecked slate blue granite slab under the gray clouds of morning, emotions flaring and fading, subsumed by a profound sorrow without many tears. We’re too used to it, now. The sobs of previous years have given way to a steeled mourning. Sometimes there is resentment at the stupid blind unfairness of the holes shot through all our hearts, the hole in our lives, and all the things she and we never got to experience. Her playgroup friends still talk of her with their parents. Rebecca was a good friend, she was funny, she was fun, she was so nice. In their way, still trying to come to grips with what happened to her. To them. They don’t mention her to us. Children, trying to protect the grown-ups. Which makes sense, since they know, now, that sometimes grown-ups can’t protect the children. Sometimes the killer gets into the house and there is nothing you can do to cast it out. Sometimes there is nothing anyone can do, except hold the victim’s hand as her life ebbs away, and wish your desperate pleas to take her place had been heard. That there was something to hear, anything to hear, and accept a frantic parent’s bargain of life for life. Ten years ago today, Rebecca came into this world. Four years ago today, she left it. I can’t remember if I ever told her I would never forget her, or if I was too afraid of frightening her. I clearly remember when and where she told me, sobbing, knowing she would die, that she would never forget me. I can still recall the terrified strength in her arms, locked around my neck. I hope I told her then. 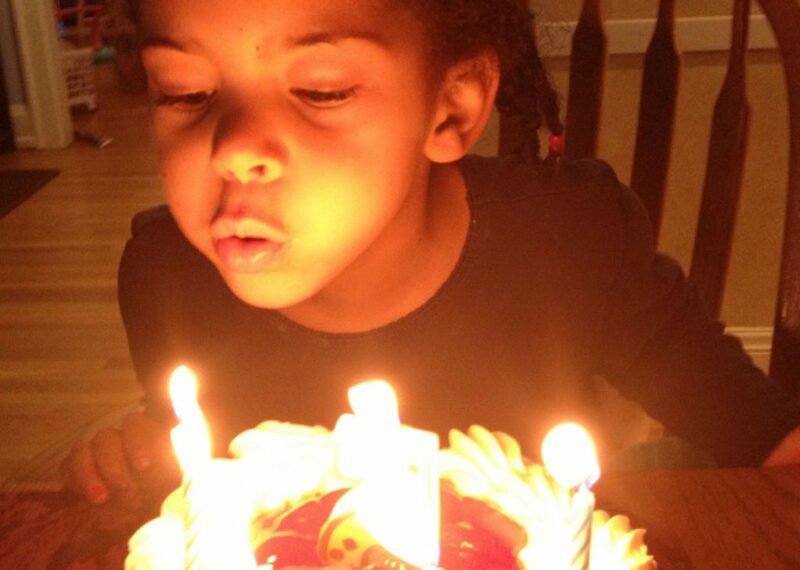 Today she should have been ten. Hi there! This is a statement regarding this web site and the data associated with it as compared to the GDPR. You might think this is ridiculous, but as my site is at least somewhat business-related—it promotes my work, invites people to contact me for consulting or speaking engagements, and the like—here we are. Meyerweb does not set any cookies in your browser, nor does it track you. This has always been the case, except for a brief period in which I enabled Jetpack to do something or other and then later discovered it was pulling in… other things. I disabled it immediately, and have no intention of ever enabling it again. Meyerweb’s web host keeps copies of the server’s access logs, which contain the IP address of the device you use to access meyerweb. It does not, to the best of my knowledge, record any other personally identifying information, unless you hacked your browser’s UA string to contain such information. Then it will be in the server access logs, and probably next to impossible to get out. As an anti-spam measure, commenters have always been required to supply an email address in order to comment. Optionally, they may supply a name and URL. If you have commented in the past, whatever information you provided is still stored in a local database, associated with that comment. If you wish to have that information removed, contact me and I’ll do my best to remove it. This may also end up with me removing your comment(s), though I will always try to preserve them. If you have enabled the “email me about followup comments” or “email me about new posts” features of the site, those are managed by WordPress.com. I do not store that information locally, nor do I have access to it in any way. If you wish to have any personal information about you removed from meyerweb, you can always contact me, and I’ll do my best to handle the request as soon as possible. If you haven’t heard back from me within ten days, please assume the first attempt got spam-canned or buried in the ongoing avalanche that is my inbox, and ping me on Twitter about the silence. Please don’t use Twitter as a method of first contact about this, since we’ll have to take any conversation about personally identifying information off Twitter and into email anyway. And I believe that’s it. If I missed anything, let me know and I’ll update as needed. In March of 2014, our son Joshua, then a newly-minted three-year-old, shaved his head for St. Baldrick’s for the first time, in support of his sister Rebecca, who at the time seemed to be in remission. This coming Sunday, now in support of all St. Baldrick’s beneficiaries and in memory of the sister with whom he shared so much love, he’ll shave his head for the fifth time. He’s been letting his hair grow out since the start of the year just for this occasion, and he’s already looking forward to 2020, when he will officially become a Knight of the Bald Table—at the age of nine. As he was last year, Joshua is a member of Team Fairfax, representing the elementary school all three of our kids have attended. This year he was designated a Team Captain despite only being a first-grader. Joshua surpassed his initial goal and set a new, much more ambitious threshold of $1,200. As I write this, he’s just over $150 away. If you can help him get over and beyond that line, he—and I—would very much appreciate it. Just over an hour before I started writing this post, I handed off CSS Pocket Reference, 5th Edition to the Production department at O’Reilly. What that means, practically speaking, is that barring any changes that the editors find need to be made, I’m done. Besides all the new-new-NEW properties included in this edition (flexbox and grid being just two of the most obvious examples), we put a lot into improving the formatting for this edition. Previous editions used a more sprawling format that led to the 4th edition getting up to 238 pages, which cast serious shade on the word “Pocket” there in the title. After all, not all of us live in climates or cultures where 24/7 cargo pants are a viable option. So with a few ideas from me and several more from the production team, we managed to add in all the new properties and still bring the page count down below 200. My guess is the final copy will come in about 190 pages, but much will depend on how crazy the indexer gets, and how much the formatting gets changed in the final massaging. We don’t have a firm release date yet; I’m pulling for April, but it’s really not up to me. I’ll make announcements via all the usual channels when pre-order is available, and of course when publication day arrives. For now, for the first time in many years, I don’t have a book project on my to-do list. I don’t even have a book proposal on my to-do list. It’s a slightly weird feeling, but not an unwelcome one. I’ll be putting the extra time into my content for An Event Apart: I’m giving a talk this year on using the new CSS tools to make our jobs easier, and doing Day Aparts in Boston and San Francisco where I spend six hours diving deep into guts of stuff like flexbox Grid, writing modes, features queries, and a whole lot more. So my time will continue to be fully spoken for, is what I’m saying. It’ll all be fun stuff, though, and it’s hard to ask for more out of my work.